Evidence of New Hampshire’s Granite State nickname surfaces when you put a shovel to dirt and almost immediately hit rock. When we were situating our mountainside house last year and excavator Dave hit the dreaded “ledge,” we were forced to relocate the house 3 feet from the initially chosen spot. So, when Valley Artesian (Ascutney, Vermont) began drilling our well last week they quickly hit bedrock. But drillers are equipped to push through. Their powerful drill pulverizes rock, which, when mixed with cooling water (they bring a truck full of it), forms a messy sludge. With us, it was short work. A hundred feet down they hit water, which was obvious from the watery slurry gushing. They then drilled to 285, hitting even more water on the way. Doug beamed when Peter (25 years of experience) said one word—15—referring to gallons per minute of water being produced. Five is acceptable but 15 means never having to worry about running out of water. Thirty minutes after drilling stopped and the multiple sections of the drill were pulled out, Peter picked up a small stone and dropped it down the well casing, listening to the splash. This time he said another number—30 feet. The water had risen 70 feet. The next day, water was spilling over the top of the well pipe at the surface, which means the water had risen 100 feet from its source in just a short time. Valley Artesian placed a pump in the drilled column at 220 feet, creating a reservoir of 330 gallons of water in the well (1.5 gallons per foot). Even though we have a pump, we have a true artesian well; the water, working against gravity, is being forced up out of the ground by the pressure of the aquifer. Well pipe and ditch running to house. And so, we have a prefect water scenario, unlimited water at a high rate of flow, a particularly impressive result in September after a dry summer. 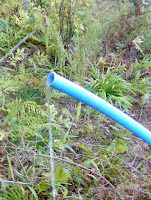 A runoff pipe was installed to allow excess water to flow by gravity into the nearby creek. Or, we may fashion a small pond a little further away, near our flower garden, so the birds and wildlife will have a source of fresh running water when it is 10 below this winter. As a bonus, we will have water available even if we lose electricity. A tap in the basement will operate without the benefit of a pump. 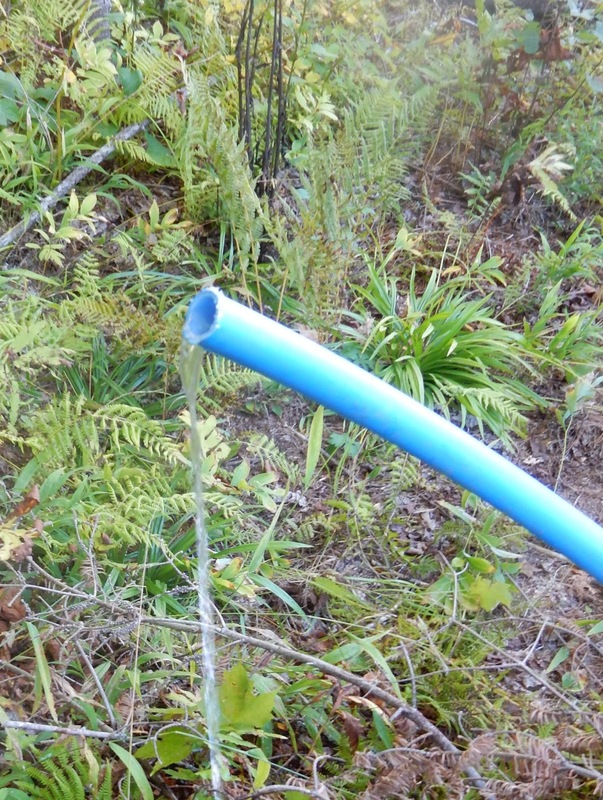 We tasted the water out of the blue pipe and it was pure, cool, and crystal clear. If you are coming up to visit, feel free to bring empty bottles to fill with delicious New Hampshire mountain H2O, filtered by its long slow journey through layers and layers of granite. Our mascot, mighty dog Gracie, the Border Terrier. I remember our well water on Little Lake Sunapee. We used lake water i the house, but pumped the well water out with a hand pump for drinking. It was delicious. And I want to know more about Gracie! Is she a rescue? How old? Gracie is a 11-week old Border Terrier pup. Born and bred in New Hampshire. Gets to be 14 pounds top. Having fun in the dirt on the mountainside. Good hiking dog, too.